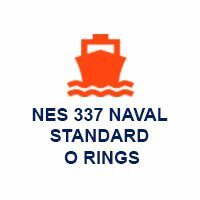 M Barnwell Services NES 337 O Rings are MOD approved to Defence Standard 02-337. These are used on UK Ministry of Defence Surface Ships and Submarines and their associated systems and equipment. Applications include hydraulics, lubrication systems, fuel systems and pneumatics. M Barnwell Services provides a complete range of NES 337 O Rings in Nitrile (NBR) and Fluorocarbon (FKM) elastomer materials. For high-pressure air systems a Hydrogenated Nitrile (HNBR) elastomer material has been developed. This specialist elastomer material offers improved service life compared to the standard Nitrile (NBR) material. The range of O Rings are available on short lead times and all manufactured to order, ensuring a new cure date. For more information download a catalogue or contact a member of our expert team today. For more information on our range of O Rings, please click here.